"Here's A Quick And Easy Way To Set Up Niche WordPress Blogs, By Instantly Turning Any Package Of Ordinary Text Articles Into A Complete Sequence Of Automated Blog Posts"
If you own any WordPress blogs, or are thinking of creating some, you really should be using a technology called "auto posting" to save yourself loads of time and effort. What Is Auto Posting And Why Do You Need It? Blogs generally rate higher in the search engine results than equivalent static sites, which means more visitors and more income for the blog owner. The reason that search engines rate blogs so highly is that blogs offer regularly updated content, making them more dynamic than ordinary static websites. However this creates a BIG drawback for you as the blog owner. It means you need to keep updating your blogs on a regular basis, which can take lots of time and effort. There is however a solution to this problem, in the form of a technology called "auto posting". With auto posting, you add a plugin to your blog along with a series of articles. The plugin then automatically posts the articles over a period of time, such as one article a day or one article a week. This means you can just set things up and then walk away. Your blog gets regularly updated, but you don't need to touch the blog again. Everything happens automatically. With auto posting, you get all the benefits of using a blog, but without all the usual hassle. This makes auto posting a "must have" technology for any serious blogger. If you're looking for a quick and easy way to use auto posting on your WordPress blogs, you wont find a better solution than our powerful new WP Post Bot. To use the software, you need a set of text articles in a folder on your PC. You can use articles you wrote yourself, or articles taken from a private label article package. Click the "Browse" button and select the folder containing your articles. Then click the "Create" button and the software will create a WordPress plugin that will post the articles automatically. You then upload the plugin to your blog using the supplied Plugin Installer Tool (see below) or using any other upload method. Auto posting normally starts with article 1, but you can change the number if required. You can select the blog category where the posts will be created (you can also have invidual articles posted to different categories if you wish). You also choose the number of days between each post. You also select the time when the posts are created. By default the time is set to "6:00 to 18:00" which means that new posts will be created at a random time between 6am and 6pm. Using a random time makes it look more authentic and less obvious that you are using auto posting. You can choose a different time range if you prefer. This shows that auto posting has started and tells you when the next article will be posted. There is also an option to stop (and then resume) auto posting if required. You can use the Create Plugin tool again to add additional articles at any time, which will be scheduled automatically on the end of the existing sequence. The software comes with our special Theme And Plugin Installer Tools. These offer an easy way to install themes (to change the look and feel of your blogs) and plugins (to add features to your blogs). Although WordPress includes features to install themes and plugins from within the blog admin system, these features do not work on many web hosts. Our Theme and Plugin Installer Tools offer a simple alternative. Here's a screenshot of the Theme Installer Tool (the Plugin Installer looks identical). To use the Installer Tool, just put the theme (or plugin) files into a folder on your PC and then use the Browse button to select that folder. If your blog is set up in a folder on your website, enter the name of the folder into the second box (otherwise leave the box blank). Click the FTP Setup button and enter your website domain name along with your web hosting user name and password. These details are remembered for future use. Click the Upload button and everything (files and any subfolders) will be uploaded automatically to the correct place on your blog automatically. 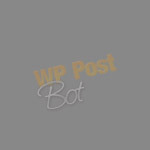 WP Post Bot is licensed for use on an unlimited number of blogs, so you can use it on every blog you own, without paying any extra. Auto posting content on your blogs gives you a very easy way to continually update your blogs without any ongoing effort. 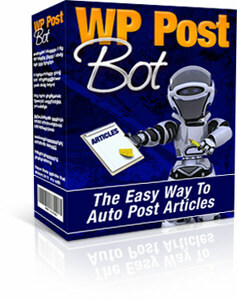 Given the power and simplicity of this software, you might expect to pay a lot for your copy of WP Post Bot, especially since you can use it on an unlimited number of blogs. That's why I'm sure you'll agree that the low price of just $27 for this software makes this an absolute bargain. The Standard Version of our software offers all the quality features and software shown on this page - for the low price of just $27. However if you're looking for the highest profit site building solution, I know you'll want the extra features built into our superb "Gold Version". This Gold Version allows you to auto post RSS content to your blogs as well, ensuring your blogs never run out of fresh content.